In the Mac’s early days, bitmap graphics were a big deal. Not every computer could display images, and even the ones that could didn’t do it very well. Apple’s Bill Atkinson developed a fantastic dithering filter which converted grayscale images to 1-bit, black-and-white bitmap images that could be displayed on the Mac’s screen. To some observers, the Atkinson filter is thought to be better than the modern Floyd-Steinberg model (also known as the error-diffusion filter) used by Adobe Photoshop today. And, in your never-ending search for creative ways to use images to add a little punch to your projects, you may consider going old-school and using some 1-bit black & white images in your work. Since we’ve moved a little beyond MacPaint in recent years, it can be difficult to get the right look using Photoshop. Luckily, there’s another option: HyperDither, from John Balestrieri of Tinrocket. 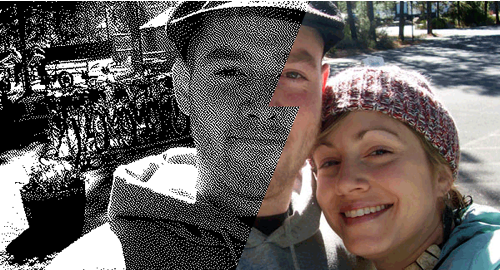 HyperDither is another one of those simple little apps that does one thing extremely well—it creates beautiful 1-bit files from your color or grayscale images. Launching HyperDither opens a window into which you drag your TIFF, JPEG, EPS or other raster image file. The magic happens behind the scenes, and no progress meter is given, but processing is quick: on my Mac Pro with 3GB of RAM, it took just a few seconds to convert 15MB images. HyperDither offers only two options with regards to adjusting your image results, Sharpen and Contrast. This is the first hint that the sharper the image and the more contrast the image has, the better the results will be. Both adjustments can be applied independently of each other after the image is converted, with a live preview in the document window. Still, HyperDither does a remarkable job with little to no adjustments at all. The image below shows you a split view of the basic results when converting a full color image. You can save your file in a variety of formats, including JPEG, TIFF, Photoshop, and PNG. More important than the saved format, however, is the size of the image you start with. Because this image is essentially converted into tiny little dots, resizing the resultant image yields horrible results, effectively destroying the effect. So, make sure you size your image to exactly what you need the final image size to be before you run it through HyperDither. If you’re wondering what you could do with such an image, consider using the HyperDithered image as a varnish plate on a bright, solid-colored page (see this Computer Arts PDF, “ Using Spot Colors and Varnishes ” for ideas). Because of the nature of the dithered image, it will be perfectly suited for varnish or UV coating on your pocket folder, brochure or sales flyer—perhaps even as an overlay on the full color version of your image. HyperDither 1.0.1 runs on OS X 10.4.7 (it should run on most earlier versions of OS X as well) and Mr. Balestrieri has graciously offered HyperDither free of charge, which means there’s no reason not to try it out. And, for those of us that care about such things, HyperDither has a pretty nice icon too!